Beanie People Point the Way on Green Pointe Way, in Marietta! 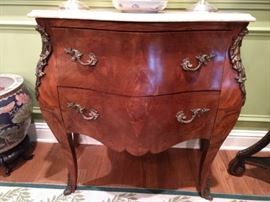 AddressThe address for this sale in Marietta, GA 30067 will be available after 9:00am on Thursday, April 25th, 2019. We accept cash, credit & debit cards as payment, with a 3% credit card fee - nothing's free, someone has to pay for those sky miles. We're a legitimate business, so we DO charge sales tax. 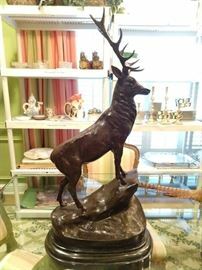 Always bear in mind that we are an estate sale company, not Neiman's. To be absolutely clear there is no warranty or guarantee of any kind for anything we sell. We don't sell on-line or over the phone, so you decide for yourself, in person, if you want an item and if it will meet your requirements. Once paid in full, it belongs to you and you are responsible for transporting it to its new home. 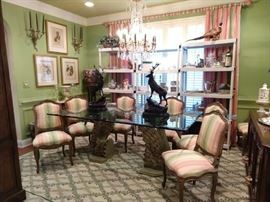 Nice Lily Pulitzer wannabe dining room! 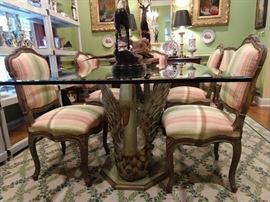 Set/8 vintage French dining chairs (2 arm, 6 sides) glass-topped dining tables, with fiberglass swan bases, pair of bronze stags, signed J. 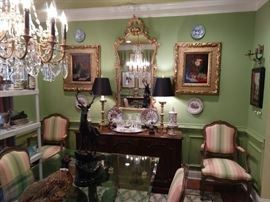 (Jules) Moigniez, framed botanicals, several sets of china, vintage Stark wool rug. 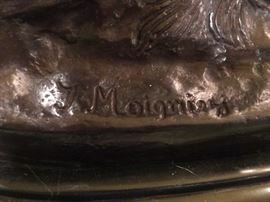 One of a pair of bronze stags, signed J. Moigniez. View of the Swan Lake table bases - don't worry, they're very manageable fiberglass, not concrete! Thanks Estate Sale gods! 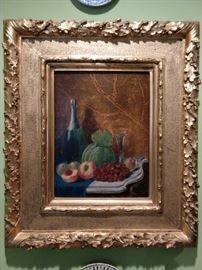 Gorgeous antique French gilt wood mirror, original oils on canvas, vinatge Baker French sideboard. Better shot of the framed botanicals, vintage French 2-drawer bombè chest, with bronze mounts and marble top, pair of Asian porcelain fishbowls, antique 3-legged plant stand. Close-up of the 2-drawer French bombe chest, with bronze mounts and marble top. 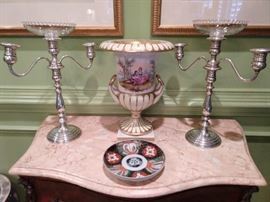 Pair of Gorham sterling silver 3-light candelabra, #660, vintage Old Paris porcelain urn, Imari plate. 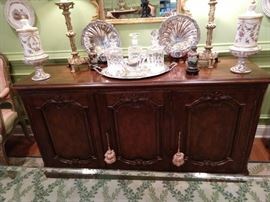 Vintage Baker French sideboard, with silverware drawers, pair of French porcelain lidded urns, pair of vintage brass candlestick lamps, pair of cloisonne vases on stands, pair of English silverplated shell servers, trio of crystal decanters on silverplated tray. 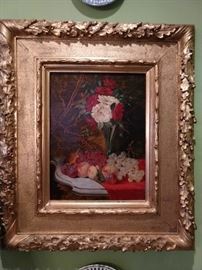 Antique artist signed oil painting, with exquisite gold gilt frame. Thankfully, none of the art in this house is from a Chinese conveyor belt. One of a pair each of French Limoges porcelains, brass Cathedral candlestick table lamps, English silverplated shell servers and small cloisonne vases, on wooden stands. Silverplated American serving tray, gravy boat, with tray and three cut crystal decanters - you have to take them and fill with spirits of choice! One of the pair of armchairs from the set/8 vintage French dining chairs. French wooden display cabinet, with wire doors, glass shelves. 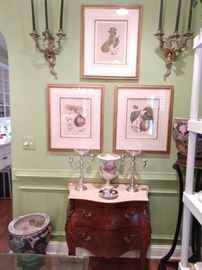 Pair of original, framed oil on canvas birds, with pair of antique brass English 2-light wall sconces. Happy pheasant, perkily perched on the Swan Lake dining table - here's lookin' at YOU, kid! LOVE the Persian rugs all over this house! This one is a Persian Heriz, hand woven, 100% wool face, measures 8' 6" x 11' 6". Persian Meshad rug, 100% wool face, measures 10' 6" x 13' 10". Seriously beautiful Persian Heriz, hand woven, 100% wool face, measures 6' 10" x 10' 7". 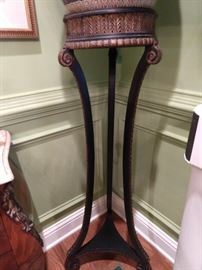 One of a pair of vintage French brass 3-light wall sconces. Vintage Persian Lilihan Sarouk rug, hand woven, 100% wool face, measures 8' 6" x 10' 9". Vintage Persian Bidjar rug, hand woven, 100% wool face, measures 2' 1" x 3' 2". One of a pair of antique French side chairs, with bottom wooden stretchers, pair of original oils on canvas and pair of hand carved Italian wooden wall sconces (wired). Nice collection of antique Asian porcelains, most with certificates of authenticity. One of a pair of newer oils on canvas, in large silver wooden frames, measure 21" across.